TAMPA, Fla. -- Drivers leaving downtown Tampa will have a tough time crossing the Hillsborough River. 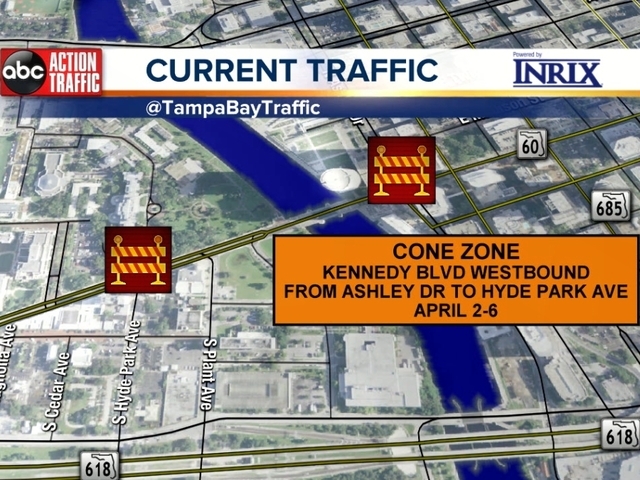 Beginning Monday, April 2 at 3:00 a.m., all westbound lanes of Kennedy Boulevard between Ashley Drive and Hyde Park Avenue will be closed for drainage work. Drivers can detour to either the Cass St. bridge or Brorein St. bridge . Access to side streets and driveways will be allowed during the closure. Pedestrian access will be available on the south side of Kennedy Blvd. Eastbound travel lanes will not be impacted by the westbound closure. It is important for drivers to know closure last all week long. The road will not reopen to traffic until at least Friday, April 6 at 12:00 p.m., weather permitting.